Contemporary Italian digital channels explicitly targeting women (such as Real Time, Lei, Fox Life, La5, and La7d) represent a privileged observatory for some general trends in the international circulation of content and incorporation of foreign formats into national television (TV). In fact, their schedules rely heavily on the genre of factual entertainment, which was first devised and used in international contexts, such as the UK and the US, and only in the second phase was imported into other national TV environments. After introducing this scenario and the main issues connected to the circulation of international content on these channels, the article will focus on the BBC docu-reality Don’t Tell the Bride. The show was extensively circulated (UK and US versions) in the circuit of Italian women channels before a national version was produced by the pay-TV brand Lei. The article will reflect on how the national version Non ditelo alla sposa added further shades to the original meaning of the format. While the international version only allowed the Italian audience to engage with the programme through a romantic and escapist approach, the local adaptation inserted practical advice in the storytelling on how to arrange a low budget yet traditional wedding day, coupled with the sarcastic and ironic points of view of the characters involved. With the transition to digital terrestrial TV fully accomplished in 2012 and a multi-platform TV environment with numerous channels and extensive viewer choice established, another phase of the circulation of international formats began for Italian TV. Encompassing both digital terrestrial and satellite transmission, this new multi-TV environment consists of various free and pay-TV platforms, including Sky and Mediaset Premium.11 Many new ‘digital-native’ channels have flourished in recent years, focusing not only on specific topics (sports, cinema, documentaries, kids’ TV, TV series, etc.) but also on gender, which is used as a means of segmenting the audience and shaping the channels’ profiles. In fact, a specific feature of contemporary Italian TV is the clearly defined group of ‘female brand’, channels explicitly dedicated to women. Many elements combine, such as the name of the channel, the logo, the graphics (such as idents and bumpers), and, of course, the programming, to construct a female-brand channel’s identity, which is precisely calculated to target a female-only audience. They are all based on factual entertainment, much of which is based on international formats. Channels explicitly dedicated to women and focused on factual entertainment (mainly in the form of the subgenre of ‘lifestyle programming’) are a significant phenomenon of contemporary Italian TV, as their pervasive presence on both free and pay TV confirms. In the 1990s, American brands, such as Lifetime, Oxygen, and The Women’s Entertainment Network, brought a new approach to women’s TV in the US.15 Following this trend, overtly female channels made their first appearance on Italian digital TV, both as branches of international media corporations (such as Diva Universal, E!, Real Time, and Fox Life) and as Italian-specific attempts (Lei, La5, La7d, and Lady Channel) in the new millennium. These channels now represent the main, clearest manifestation of Italian women’s TV. Channels specifically targeting women form a rich, multifaceted group. Their development dates back to 2004, when the Fox Life channel was launched on the Sky satellite pay platform as a spin-off from the Fox corporate brand (already part of Sky’s offerings), specifically targeting women. Numerous other female channels soon followed. The switch to digital terrestrial TV in 2012 has increasingly been marked by gendered narrowcasting, profitably practised by the media industries and advertisers alike. Each Italian female channel presents some specificity; however, they are currently similarly centred on the genre of factual entertainment. Despite the difficulties in precisely defining factual entertainment as a genre with clear borders, some general and recurrent traits can be identified. Closely bound with the concept of reality TV, factual entertainment presents a fixed situation and a dramatic setting with characters who ‘play’ themselves and face challenges calculated to transform some aspect of their daily lives. Factual entertainment also very often includes a competition or game situation. Focused on the factual genre, Italian channels for women represent a privileged position for us to observe and reflect on some general trends in the international circulation of content and the incorporation of foreign programming strategies and concepts into national TV. Factual entertainment was first devised and produced in international contexts, such as the UK and the US, where digitisation was completed sooner than in Italy16 and other small countries like the Netherlands, where even the major channels have to operate with much smaller programming budgets. Gradually, the genre came to be imported into other countries, including Italy. The Italian TV industry first brought factual into the digital pay-TV scene through various international media groups (e.g., Discovery) that used their international library to fill the schedules of their thematic channels, such as the Discovery Channel and Discovery Science. These offered the original versions of well-known TV brands, such as Top Gear and How it’s Made, as finished programmes for a largely male audience. Then, a major gender shift occurred, and factual became the main preserve of female channels; Fox Life led the change in 2005 with the Italian adaptations of a few international formats, including Cambio moglie/Wife Swap and Sos Tata/Nanny 911. Factual soon became a convenient form of content to fill female digital channels and a way to manage viewer expectations, primarily by acquiring many finished international programmes but also including a few factual-inspired Italian productions. However, the quantity of entirely domestic content that is devised and developed in Italy is very low. The local and global coexist in new ways in these channels’ schedules. On one hand, foreign content presents a chance to escape from reality, since the stories in factual-entertainment programmes involve discovering different worlds to contrast with the viewers’ own familiar milieu and life experiences. On the other hand, local adaptations of formats claim to offer practical information for viewers to use in their everyday lives, from beauty tips and recipes to child-rearing help and ideas for running a better home and improving its decor. Closely examining the group of Italian digital channels for women, we can identify two main ways in which these channels open a dialogue with international TV through which transnational storytelling models circulate within national borders. The first is the simplest. International finished programmes are adapted for Italian consumption through a single linguistic process – now an increasingly sophisticated and expensive one – progressively matching the ‘fiction standard’ (e.g., using more dubbing artists, one for each character of the programme). Moreover, in the dubbing process, a first and general ‘domestication’ of the content is carried out. For instance, typical sayings in the original, foreign language are replaced with phrases that are more meaningful in Italy. Usually, Italian female channels prefer to schedule the international versions of shows that could be too expensive or complicated to produce or that present strong and ‘controversial’ themes, such as physical or psychological disease. For example, this is the case for Embarrassing Bodies, whose original version is a Real Time’s pillar title. A second method is to adapt international formats for the national market. For this, women’s channels scout from the wide range of programmes dealing with ‘female’ themes (beauty, health, cooking, the home, makeovers, etc.) that have already been explored in foreign TV markets. Mostly these formats come from the US and the UK. In most cases, the female channels’ original productions rely on licensed, unscripted formats to exploit this production model’s classic advantages, which include limited risks and limited creative investment coupled with the ‘expertise transfer’ that comes from the interaction with the foreign licensor of the format. It is useful also to remind ourselves that in Italy, the possibility to broadcast international TV content is regulated only by European Legislation. The Audiovisual Media Services Directive (formerly the ‘Television without frontiers’ directive) states that at least 50% of the broadcasting time should be dedicated to European films and TV programmes (excluding genres such as news, sports events, games, advertising, teletext, and teleshopping services).17 Adaptations of formats have the benefit of counting as domestic productions and thus help fulfil more than 50% of the quota. It is interesting to consider which themes and sub-genres appear to be seen as the most suitable candidates for national adaptations. Formats that bring in local traditions and cultures are a case in point, featuring outdoor locations and other meaningful aspects of a national community’s daily life, like food. Moreover, some sub-genres and themes seem less appropriate for international ready-made use but are perfect for domestic production. These include the ‘narrow’ factual tutorials (on beauty, cooking, home décor, and so on), abundantly aired by Italian female channels in the last few years. They easily reflect local taste through the reference to national design, fashion brands, cookery traditions, etc. Also, to be able to provide the viewer with useful, practical advice, they require a national context. Thus, in these cases, female channels prefer to use local content. Finally, primetime talent shows are a fertile source of adaptations. Prestigious international talent shows18 from Project Runway to MasterChef and Bake Off require major economic investments to produce and offer special primetime events to punctuate female channels’ usually ‘low-key’ schedules. In many cases of Italian adaptations of foreign content, the programmes have already been screened on various Italian women’s channels as international ready-made programmes. Viewers already know how the formats work and already have expectations of several programme brands. This process also characterised the Italian circulation of the international and local versions of the format Don’t Tell the Bride. 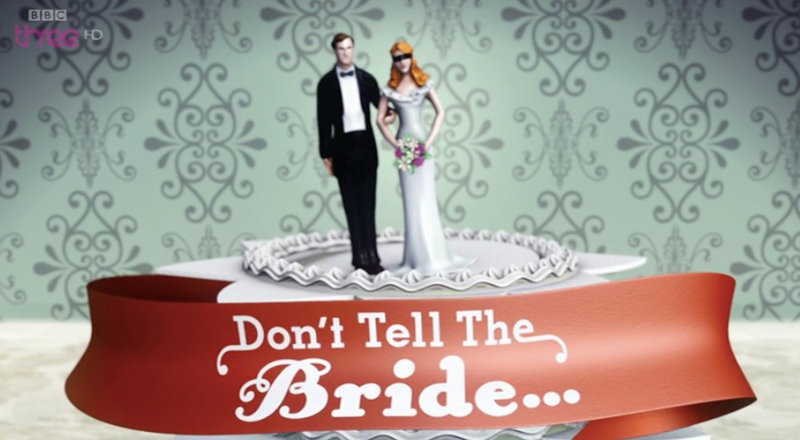 In 2007, the independent production company Renegade Picture Productions made the first season of Don’t Tell the Bride, which was to air on the British public-service broadcast channel BBC Three. It comprised six 60-minute episodes and would soon become a very long-running show, reaching its eighth season in 2015, meanwhile moving to BBC One. Figure 1. Don’t Tell the Bride on BBC Three (opening credits). Don’t Tell the Bride has the typical characteristics of a factual-entertainment programme. Indeed, it can be termed ‘partially scripted’ because, although its characters are ordinary people playing themselves, they do so in situations and according to rules and mechanisms devised by the production team, in which they are free to react according to their own sensibilities and personalities. The programme consists of closed episodes (i.e., one wedding per episode) and the structure is identical in each. A couple has decided to get married, and the producers provide a (fairly limited) budget for the ceremony and reception on condition that every detail of the organisation is taken care of by the groom, leaving the bride in the dark about everything until the big day itself. Every episode has recurrent, standardised key moments that are essential to giving the show a clearly identifiable structure and that have allowed it to become a format. These are presenting the couple at the beginning, the moment when they are separated for three weeks, organising the ceremony with the groom’s inevitable worries and blunders (which are always contrasted with the bride’s wishes), unveiling the dress, the wedding day, and the happy ending. The format’s structure engages the audience in various ways. The first is the suspense created by the game in which the couple agree to participate. Will the groom manage to carry off all the tasks, major and minor, involved in organising the day to his bride’s satisfaction? The second is the over-the-top, caricatured ‘battle of the sexes’, in which the woman’s expectations are contrasted with her partner’s attempts to fulfil them. The mechanism in Don’t Tell the Bride is nothing new. In essence, it represents one of the factual genre’s most popular staples – the fish out of water, similar to other hit shows from Undercover Boss and Wife Swap to Faking it. Thus, one of the factual genre’s ‘classic’ themes – organising a wedding – is handled by combining an emphasis on interpersonal relations with a game mechanism centred on the obstacles that the groom must overcome. The image of the groom struggling and the play on the contrast between the woman’s expectations and the man’s efforts underpin the format’s ironic and hence entertaining angle. The programme also combines variety with repetitiveness, via a recurring mechanism coupled with a continual change of situations, settings, and characters. After scheduling the original English version for a few seasons, Lei bought the rights to remake the format. It produced the Italian adaptation, entitled Non ditelo alla sposa, which aired for a single 12-episode season in 2012. Lei produced it in-house with funding from the female channel La7d, which co-produced the show in order to secure second-window rights in its schedule on the unencrypted digital terrestrial platform. The decision to adapt the format for the local context primarily reflects a classic tendency in which broadcasters favour catering to the Italian audiences’ taste for local stories, settings, and characters.21 Moreover, although the Italian channels for women are strongly focused on broadcasting ready-made foreign programmes, some Italian productions are deemed necessary to consolidate the channel’s identity and audience appeal. A chronological overview of their programming demonstrates how each of them has invested progressively in at least a few local shows. The remake of Don’t Tell the Bride forms part of a rich seam of wedding-themed programmes, one of the staples of contemporary ‘TV for women’. The many possible variants include the ‘wedding reality show’, which immediately became a centrepiece of the output on two American channels, Women’s Entertainment (WE TV) and TLC. The Italian digital channels have ‘imported’ weddings along with the factual genre’s other strands, both by including wedding-related programmes in their schedules (one of the first being Wedding Planners on Real Time) and by creating dedicated wedding-themed channels (such as Wedding TV and La Sposa, both on digital terrestrial). In addition, Lei has also devoted a sizeable section of its schedule to weddings, offering various foreign imports (My Fair Wedding, Amsale’s Girls, Wedding Dress War, and Keasha’s Perfect Dress) and producing some programmes of its own, including Non ditelo alla sposa (Don’t Tell the Bride) and Chi veste la sposa? Mamma contro suocera (Who Will Dress the Bride? Mother vs Mother-in-law). Not by chance, all of Lei’s original productions thus far have focused on weddings and cooking, such as Cambio Cuoco (Chefs Swap) and Staffetta in cucina (Recipe Replay). Both topics are highly relevant to Italian society and facilitate reference to traditions and lifestyles that are strongly linked to the national identity and are very familiar to the local audience, which can therefore see itself reflected in these programmes. Strands such as plastic surgery, makeovers for dire houses, and treating mysterious and dangerous diseases, on the other hand, are left to international productions, which can wrap strong, controversial subjects in far-off cultures, thus appealing to the fascination for the exotic. Non ditelo alla sposa ran for just one season because the channel’s budget shrank and there was a moratorium on original productions. However, the show’s 12 episodes fully reflected the narrative structure of the BBC original. The couples were offered €15,000 to organise the day and three weeks to do it, during which time they had to be parted. Analysing the Italian adaptation, it can be argued that the format re-versioning had to consider two aspects: first, the need to include references reflecting the local traditions and culture and second, the need for the show to fit harmoniously with the editorial policies of the Lei women’s channel. The Don’t Tell the Bride docu-reality format lends itself to adaptation in other countries because it offers the opportunity via the wedding preparations to show places and traditions specific to the culture of a particular place. The Italian version focused on several specific aspects. First, the couples were cast to exploit Italy’s characteristic variety of local and regional cultures. This was enhanced by a much greater use of outdoor locations than in the foreign versions and was brought out by features like local wedding-day traditions and the accents of the participants, who come across as ‘natural’ in the production. The variety, landscape, and culture of Italy’s many regions unfurled as the series progressed. 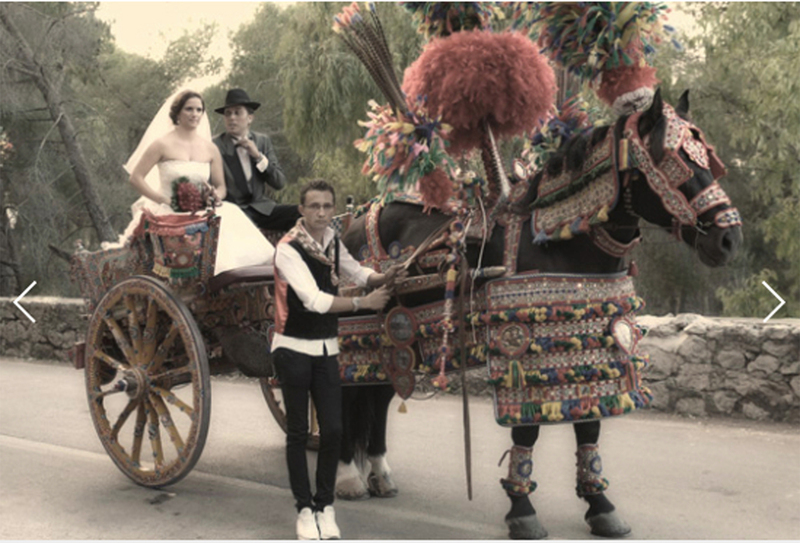 For example, episode 12, Fabrizia and Danilo, was set in Sicily and showed some archaic local traditions, such as the couple’s departure in a typical old carriage. 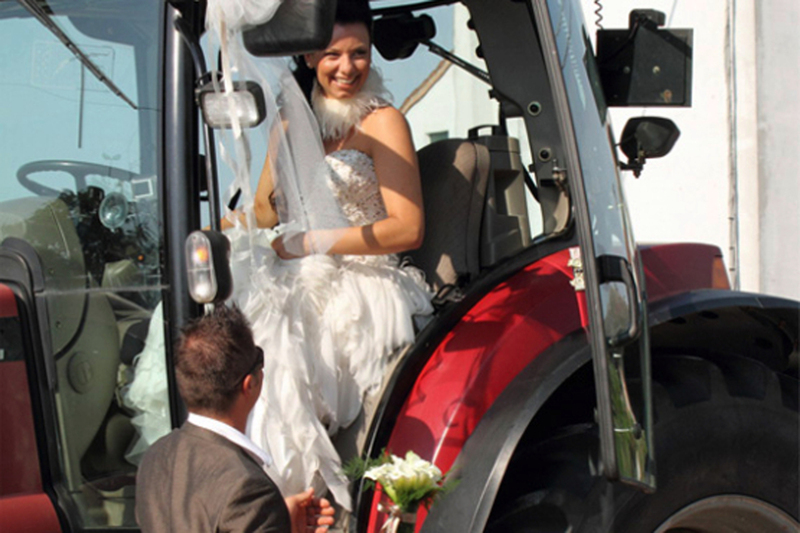 Equally, episode 11, Sonia and Diego, featuring a couple who live in the Veneto countryside, included the bride’s arrival on a tractor. Figure 2. Non ditelo alla sposa, ‘Fabrizia e Danilo’, 1:12. Figure 3. Non ditelo alla sposa, ‘Sonia e Diego’ 1:11. Compared to the programme’s international versions, the Italian version shifted the spotlight from the couple’s entourage of friends (especially the best man, a less important figure in the Italian wedding tradition) to the bride and groom’s families, with a special focus on the relationship between the brides’ mothers and their sons-in-law. The locations and the couples were selected in line with the channel’s identity. According to Francesca Carravieri, former editorial director of Lei and other RCS digicast TV channels, who supervised the Non ditelo alla sposa project, Lei is keen for its original productions to recount everyday provincial life, a world away from the luxurious metropolitan lifestyles depicted in the Italian productions of its competitor Real Time. She explained, ‘Italy has two large cities, Milan and Rome, but most of its territory is the province. The province is the mirror of our audience: the women who like DIY, home-made cakes, who dream of fairy tale weddings and devotes time to a television that stimulates them but also makes them smile’.22 The topic of the wedding, with its mix of universal values and local traditions represented the perfect way for the channel to address its target audience. She continued to explain, ‘For some topics like plastic surgery, obesity, crime stories, design and property makeover, international programs work great. Marriage is a subject of great success regardless of the place of production, but some things such as cooking and traditions are eminently local’. Following a classic paradigm of factual-entertainment programmes, Non ditelo alla sposa seeks to combine entertainment with a realistic attempt to document the world. The programme’s game component with its predefined mechanism provides the entertainment. Meanwhile, the stories of the couples and their entourages are selected to provide a diverse snapshot of contemporary Italian society, showing different types of weddings (civil and religious) and various types of heterosexual couples (with children or ex-spouses in the picture). Video 1. Non ditelo alla sposa, Lei, 2012, promo. Go to the online version of this article to watch the video. Figure 4. Non ditelo alla sposa, ‘Antonio e Giuditta’, 1:3. The Italian adaptation also offered the chance to emphasise the format’s ‘utility’ dimension, as the various aspects of the stories (from choosing the wedding favours and the bride’s dress to deciding where to have the reception and devising the menu) were presented in an Italian context that enabled viewers to gain useful information on wedding planning. Compared to the international version, the Italian adaptation tries to engage its viewers through practical advice and through the pleasure of identifying with the people and immersing oneself in the events. This approach also requires a certain adroitness in the writing, especially to avoid constructing an image of the bride as sad and disappointed by the groom’s mistakes (softened by the ironic voice-over), which female viewers could easily relate to and appreciate. As noted before, the format’s Italian adaptation also had to consider the specific profile of the Lei channel, which needed to construct its identity through a coherent, coordinated image, partly to stand out from its most successful competitor, Real Time. Thus, Lei’s approach to the ‘happiest day’ theme was also coloured by its brand values and characteristics: a less aggressive, less glossy style than that of Real Time and a closer focus on the ‘ordinary’ everyday aspects. The Italian adaptation Non ditelo alla sposa is part of this branding attempt. It was planned by the channel as a flagship component of its June 2010 rebranding, partly in light of the good performance of the English version, which was already in rotation in the channel’s schedules. As with all local productions, Non ditelo alla sposa also formed part of an evening of dedicated primetime viewing, perhaps in an attempt to get men and women to watch together. This may explain the strong male viewpoint and the programme’s ironic tone. The identity of the TV channel has played a major role in the editorial choices concerning the production of the show. As Andrea Esser has recently pointed out, the concept of ‘local’ in TV adaptations must take into account complexity, which includes references to a shared ‘national’ identity but must also consider other variables, such as the characteristics of the broadcasting system at a given time. Furthermore, ‘[a]daptation includes considerations to modify content in ways that take into account the specific audiences targeted by the broadcasters with the programs in question’.23 The differences between Lei’s adaptation of Don’t Tell the Bride, featuring the province and ordinariness, and the glamorous Enzo Missione Spose, which is Real Time’s re-versioning of TLC’s Randy to the Rescue, represent a case in point. Where Lei chooses to adapt the topic of the wedding bells, one of the international female TV’s favourites, presenting an ordinary world not distant from the majority of its audience, Real Time bets on the representation of luxury, urban settings, and the latest lifestyle trends. Video 2. Non ditelo alla sposa, Lei, 2012, The wedding dress unveiled. Go to the online version of this article to watch the video. Figure 5. Enzo Missione Spose, 1:5. In the context of Italian TV history, the arrival of satellite pay TV in 1993 and the transition to digital terrestrial TV in the 2000s have contributed to increasing Italian broadcasters’ dialogue with the international content market. Mainstream channels, such as Rai and Mediaset, continue to prefer local programmes (except for drama), in the form of both original creations or adaptations of international formats. However, native digital channels, including those for women, turn mainly to the international markets, primarily the UK and the US, to buy the rights to finished programmes and licences for format adaptations. This increase in Italian TV’s transnational dimension is closely tied to the growing popularity of the factual genre (derived from reality TV), a major trend in contemporary TV that has forced Italian digital channels to look to the international markets more systematically. As Don’t Tell the Bride and its adaptations on Italian channels for women have proved, digital channels use new strategies to deal with international content and formats. Unlike what happened in the ‘super format age’ (when Italian TV featured only local versions of international hits) and what still happens on mainstream TV, different national versions of various shows are scheduled at once on contemporary digital channels. After airing the UK original and the Italian adaptation of Don’t Tell the Bride, Lei featured the Irish and the Australian version as well, taking advantage of its audiences’ previous knowledge of the format. However, the Italian version was the one that scored the highest ratings. According the format distributor, ‘the programme reached the best ever audience result since the channel’s rebranding (June 2010) and the best ever result among the factual shows broadcasted by Lei’.24 It seems that their approach of using multiple international versions does not devalue any of the programmes; rather, it seems to be an effective tool in helping manage audience expectations and building the viewers’ competence in concepts and methods of storytelling. Moreover, different versions of the same format as well as multiple similar formats enable different kinds of audience engagement. While international versions stimulate a taste for exotic locations and cultures and present themes (such as romance and weddings) that appeal to universal feelings, the Italian shows bring the pleasure of seeing one’s own culture reflected in a story and provide practical information that viewers can use in their daily lives. Cecilia Penati, PhD, is Adjunct Professor of International Media Systems at Università Cattolica del Sacro Cuore in Milan and Adjunct Professor of Media for Arts at the International University of Languages and Media, Milan, Italy. She is also a senior researcher at Centro di ricerca sulla televisione e gli audiovisivi (Ce.R.T.A. ).